Daring burglars entered a Thai restaurant in North Center early Wednesday, then tore through a common wall to gain access to the jewelry and coin shop located next door, police said. No one is in custody for the caper. 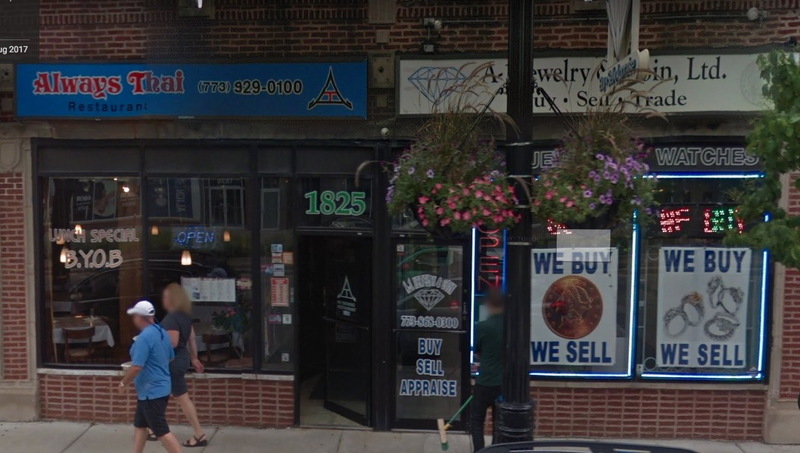 An employee arriving for work around 9 a.m. found a hole in the wall and an alarm box missing at A-1 Jewelry and Coin, 1827 West Irving Park Road, according to police. Officers investigated and found that thieves had forced their way through the back door of Always Thai at 1825 West Irving Park and then smashed their way through the businesses’ common wall to access the jeweler. Safes were damaged and electronics were moved during the jewelry store heist, but police declined to release information about any losses suffered. In the Thai restaurant, the cash register was damaged, but nothing else of value appeared to be taken, according to a report. The through-the-wall burglary technique is unusual but not unheard of in our area. In September 2015, burglars tore down a down a wall between a Latin restaurant and a neighboring hair salon in the 3300 block of North Broadway in Boystown to steal from both establishments. The king of wall-breaching burglars, though, is the crew that broke through a wall and drilled into the safe of Steve Quick Jewelers in Lincoln Park early one day in February 2012. Those bandits made off with $500,000 in gems. Exclusive reporting from your neighborhood. We can only do it with your support. Donate $49 or more to receive a year’s worth of exclusive reports and services.